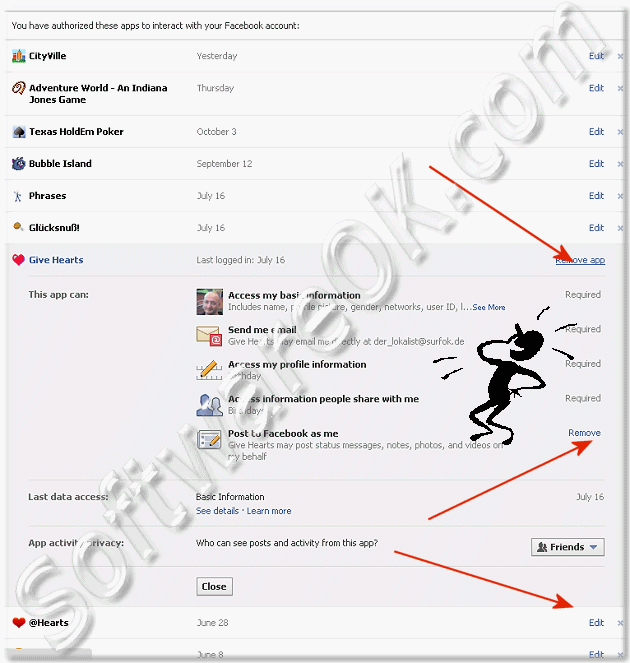 It is fairly easy to remove the facebook applications, games and websites, or make the notification settings. Here's the direct link to fast to do in your Facebook.com Account ... facebook.com/settings/?tab=applications! But, what for settings you can make in applications, varies from application to application. Internet-WWW - FAQ-3: How to delete or remove applications on Facebook.com and chainge the settings? How can I delete my Facebook.de remove applications, and settings and notification? "Will you KISS me" I think DOF, and I want to delete from facebook, how do I remove it? "The Mood Weather Report" and "Give away a rose" plus "Fun for Friends" block on Facebook, but how? How can you delete an application from Facebook.de again, remove or! Is there a solution to play games from my Facebook Acount remove? When I click the top right of the account Facebook.de come, not the applications, what have I done wrong? How can I CityVille remove from my facebook? I would like to "Texas HoldEm Poker" remove from my facebook account, but how? I need that in my Zoosk Faccebooker not know what I can do? I want "Bubble Iceland" play no longer, as I delete it from my facebook? Skype works I do not need anymore and want to get rid of was, how do I delete it from facebook? Phrases I no longer need, I will remove the notification settings Facebook.de? I used Give Hearts, "@ Hearts," "Horoscopes Coffee," "World Café", "Puzzled Hearts" and "My Best Followers" but I will remove it from my facebook, what can I do? Causes, Mafia Wars, kisses, phrase, Game Coins, Skype Me, iheart, @ Hugs, Badoo, Sunflowers Give Girasoles, FishVille, @ Smiles, Daily Horoscope Games are nice but I do not need to FaceBook.de what I can make to remove or delete it?